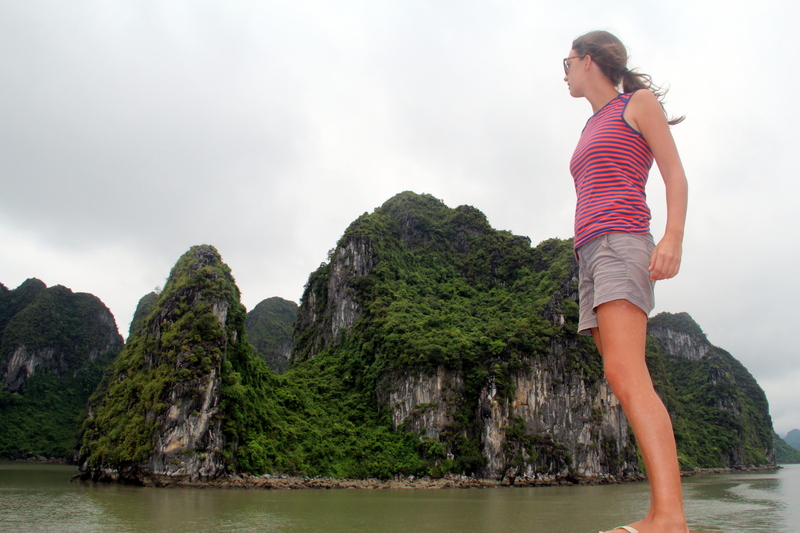 While in Hanoi, we did some research on Halong Bay cruises, and ended up choosing the 3-day/2-night Monkey Island tour. There are a million operators online and in every street of the Old Quarter, and some are dirt cheap… but we read a lot of negative reviews for the budget options (food quality and quantity, group size, crappy boats, number of stops, etc. ), and decided we could splurge a bit for one of the highlights of our trip. We were picked up around 8am in a shuttle van, which drove us for about 3 hours to the Hon Gai harbor. The drive was somewhat scenic, and there was a mandatory pit stop at a giant gift shop. At the harbor, we navigated through hundreds of people, quickly embarked on our boat and were assigned our cabin. The boat was rather new and spacious, especially given that there were only 5 of us (another advantage of low season). Soon we were on our way and started enjoying the famous karstic landscapes, while being served a yummy and varied lunch (drinks were not included, not even water, so bring your own). 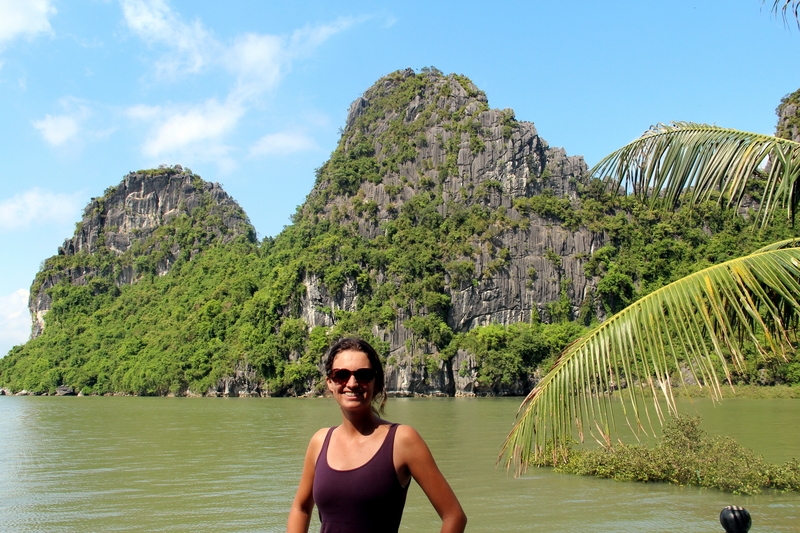 Right after lunch, we stopped at Thien Cung to visit one of the most amazing caves I’ve ever seen. The space was huge and the formations were amazing; the only downside was that someone decided to illuminate most areas with Disneyland-like lights. 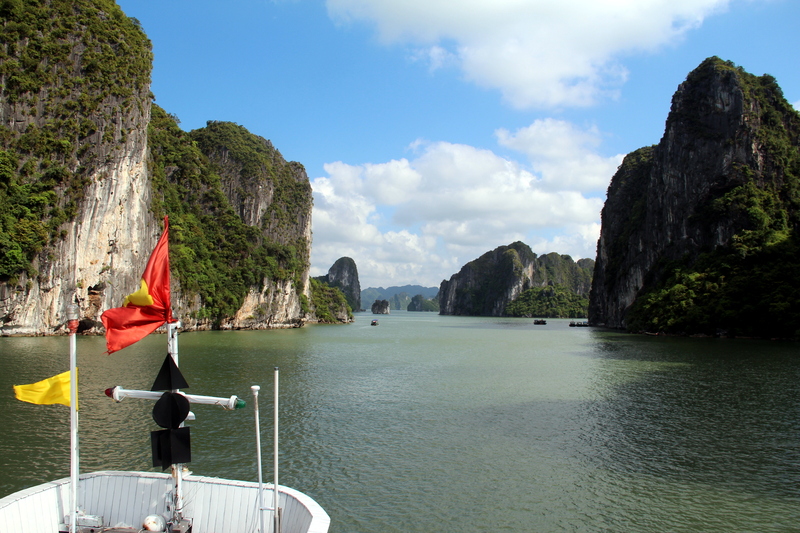 Back on the boat, we cruised further, passing Dog and Dinh Lu Huong islets. The sun was shining and the landscapes were absolutely gorgeous. We relaxed on the deckchairs of the boat, and took hundreds of pictures, always discovering a different view. We stopped again, this time to go kayaking into some sea caves, open to the sky. And after some more cruising and gorgeous limestone cliffs, we arrived at our anchorage for the night, a quiet, clean area in front of Cat Ba. It was the perfect time for a dip, with the water still warm enough and colors changing around us. We ate a solid dinner, which included us making our own spring rolls, had some local wine, and passed out exhausted and happy. The next morning, the weather turned on us. We woke up to a storm that threatened to ruin the rest of our cruise. 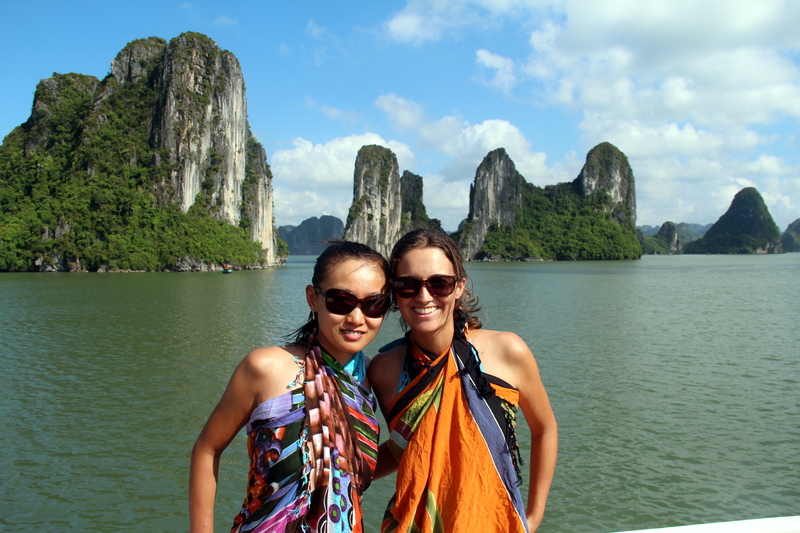 Due to the waves, our guides couldn’t arrange our transfer to Monkey Island, so we had to wait for a couple hours. Finally, we were able to disembark on Cat Ba, take a bus to cross the island, and after waiting for another hour, take a smaller boat on Lan Ha Bay to our destination. 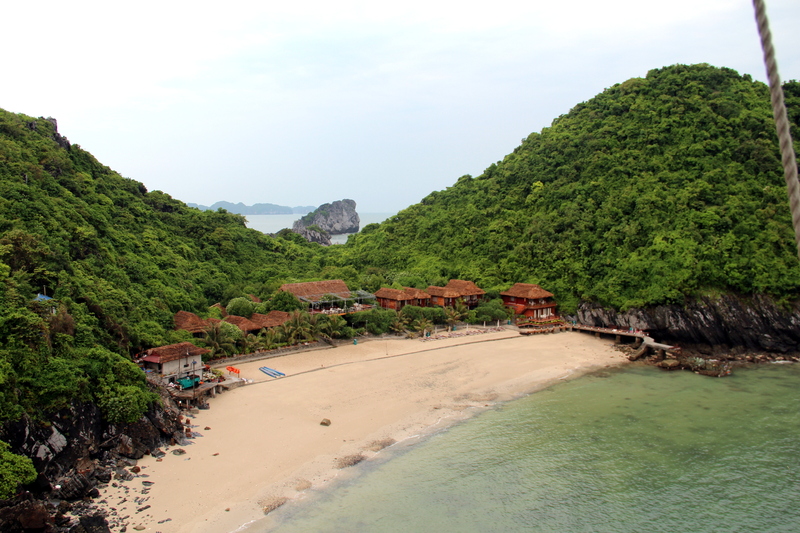 The Monkey Island resort is composed of a dozen bungalows and located in a cute islet, with an ok private beach. The wonderful surroundings, which you can explore on a kayak, are what make it worth it, though due to the weather we were not able to fully enjoy them. At least, we got to do some nice hiking. 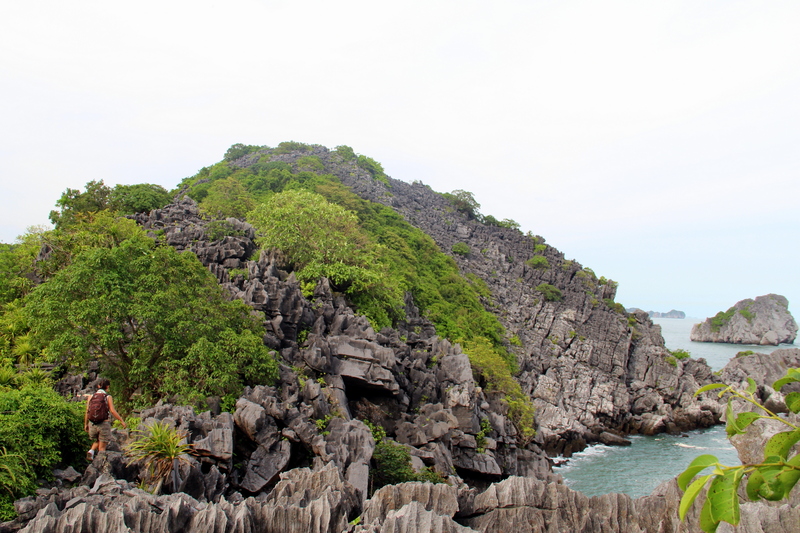 First, we climbed up to the viewpoint in front of our bungalow, and then we hiked across the island to the public Monkey Beach. The trail was rough and we were glad we had brought our sneakers with us, since the rest of the group couldn’t come with their flip-flops. The views on the way were beautiful, while the beach itself was too crowded with tourists spoiling the monkeys to be enjoyable. Back at the resort, we had a delicious buffet dinner, including oysters and squid bbq, and retired to our bungalow to fall asleep to the soothing sound of the waves. 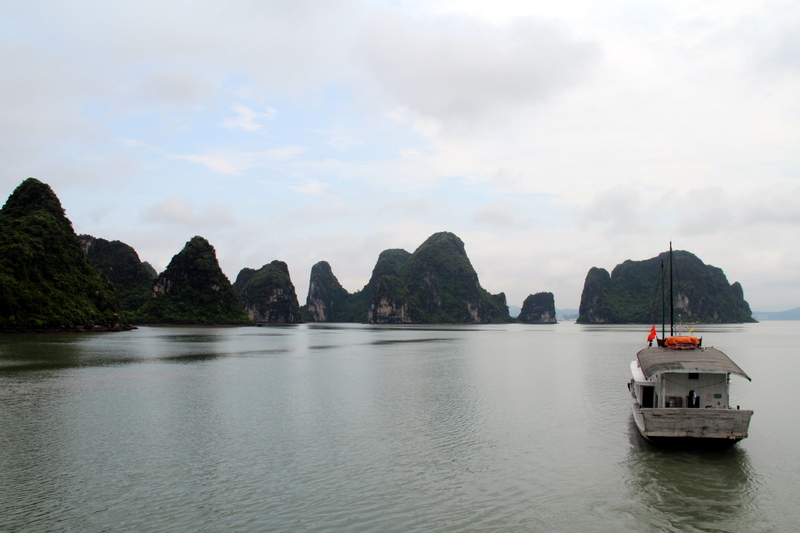 Halong wouldn’t send us off with good weather. 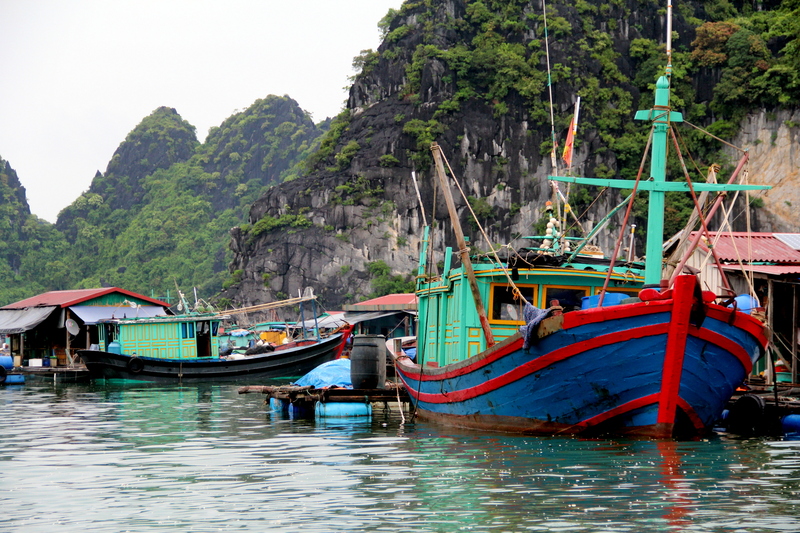 We left Monkey Island under grey skies and drizzle, and cruised back to Cat Ba’s Ben Beo harbor. 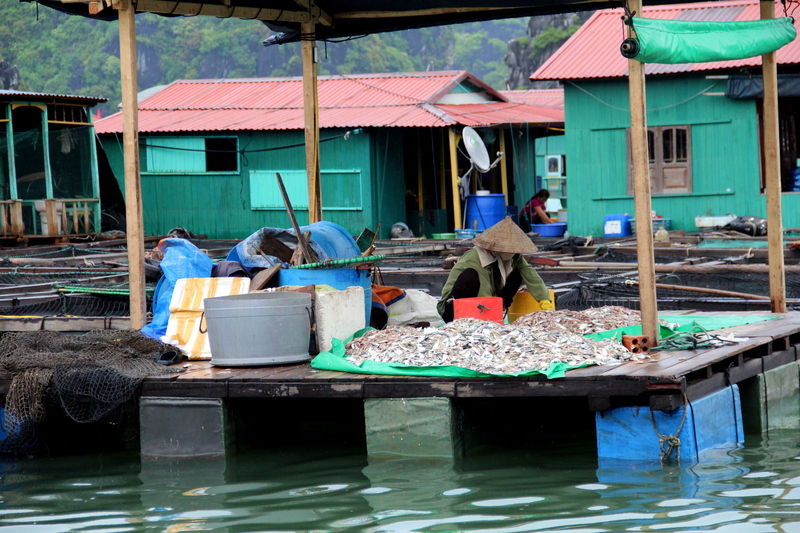 On our way, we stopped at the Cai Beo floating village, a really interesting settlement of fishermen. They showed us their homes and the fish and seafood they had caught or were “farming”. 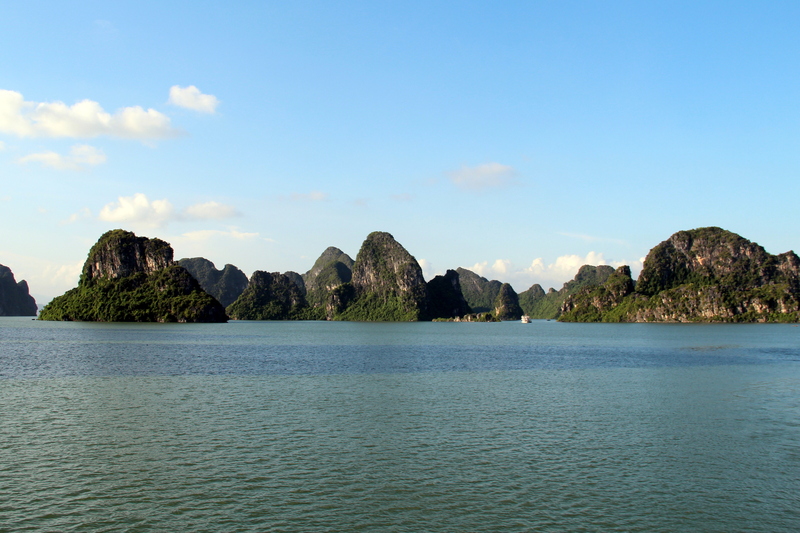 It took us about an hour to drive across Cat Ba and get back on our ship, and then we cruised slowly back to the mainland. The landscapes were impressive, but nowhere close to the beauty of our first day, when the sun was intensifying the green and blue colors. Overall, we were satisfied with our experience, and glad we took enough time to enjoy this natural wonder and get some perfect weather. The most amazing and most surprising view were the caves. They are one of the best examples of nature’s beauty.